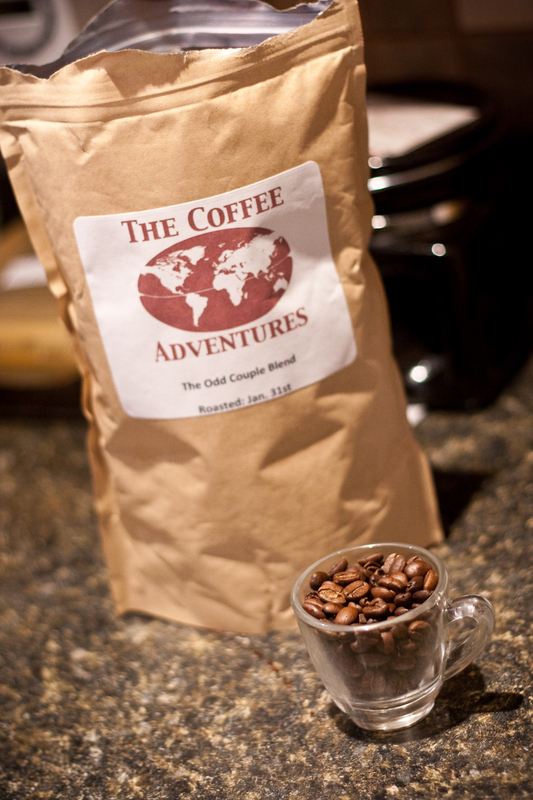 Over the past 2 weeks, Jamie @ The Coffee Adventures down in Florida sent me two bags of her best-selling blend “The Odd Couple”. Thankfully, both were roast dated – something you don’t see often enough in the coffee world (but that’s a whole other post). Right, so this review was a bit of a Coffee Adventure in itself [pun untended]. Originally designed as a two bean blend for press-pot and pour-over, we decided to do some testing on the espresso machine. This of course was very exciting! Before I go any further I do want to post a disclaimer stating I did try this as both a press-pot and an aeropress (with the new Coava Disc). I will be comparing my notes from these techniques to what I get in the cup as espresso. WARNING: this is very bright as an espresso. Love it or hate it, but I’m always open to working the coffee to find the best notes. To be honest, this coffee actually benefited from an unusually long rest period of a week or more. Over the course of the week I found more jam-like notes coming off the coffee, and this was especially true as an espresso. It really mellows out and rounds off, and I was able to get a really desirable result. The best results I got as an espresso were all around 96 degrees Celsius (relatively high for espresso). Dose could vary from 19-20 grams, and total shot length of ~30 seconds was ideal. This is a whole other beast, so I’ll do my best to be brief here and set-up for the espresso details (this is valuable information to use as a comparison). This blend really was certainly odd, and the best way I could describe it was both coffees (in the two bean blend) ‘fight’ back and forth offering different notes across my palate. My notes were: berry, honey and pecan on the finish, which was strangely dry. I also found a little spice in there too. I’m calling it a medium acidity with a spring-off-my-tongue brightness. On the aeropress I was even able to find this excellent strawberry note (with the Coava disc). There was a little bit of a musty, gritty note occasionally from the Indian coffee which added a strange contrast (not necessarily balancing the coffee). I battled for a long time to try and find exactly how to describe one particular flavour, which I kept thinking was orange juice, but it was more of the acidity. Unfortunately it fell a little flat as espresso, but nevertheless it was interesting because of the brightness and berry + stone fruit notes. I REALLY need to point of that my favourite shots were a whopping 10 days off roast. My notes were: brightness like crazy, acidtiy goes up from the non-espresso methods, with honey and some brown sugar elements. Again finding a nutty dry finish. Unfortunately the body does suffer as an espresso, but nevertheless still fun. As the espresso aged, I was able to find some jam-like notes around day 10 and 11. As a 6oz cappuccino, I could still find some of that brightness, which was excellent in contrast to the whole milk I used. It was relatively sweet and the acidity cut through the milk really well. I also noticed the musty, gritty element from the Indian smoothed out a little into a chocolate play. As an americano I found it was okay. Honestly, I’d take it as a press-pot or pour-over any day rather than the americano. This was very difficult to rate, especially given the fact this whole thing was an experiment, really. After some thought, I’d give this a respectable 84 points. Total 100 point score of 84/100. 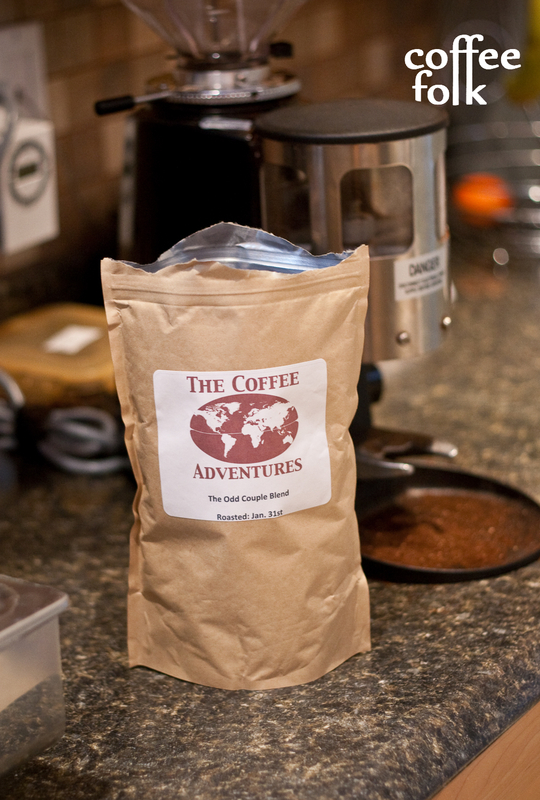 Jamie @ The Coffee Adventures down in Florida sent me one of her best-selling blends this week to play with on the espresso machine and as a press-pot. It will be arriving in two batches, the first one for testing, and the second for my final review. Well, the first batch of “The Odd Couple” came in yesterday afternoon and I wanted to get a quick preview of it out. On top of this, I also wanted to get a short video out on press-pot technique, so this seemed like the perfect time. This one is interesting, and she disclosed it to be an Ethiopian and Indian blended together – thus earning the name Odd Couple. 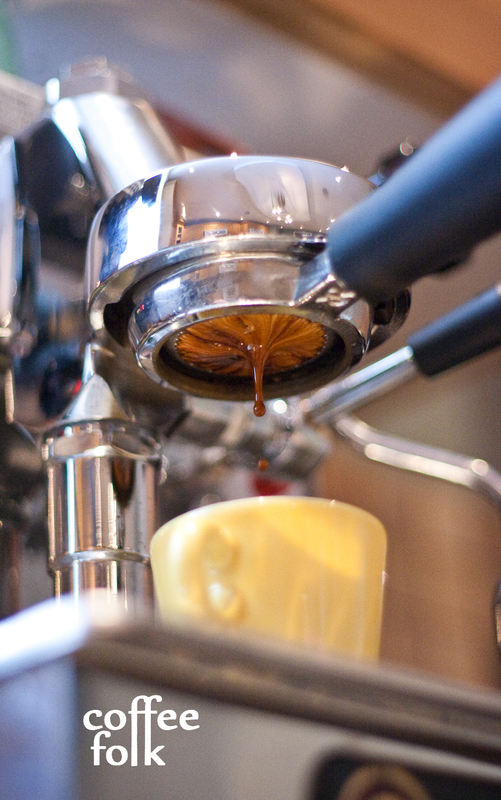 Playing with this on the espresso machine was strange, but the results from the press-pot were pleasing.